"The first two mobile mission system facilities, developed by Varley Group to support the Royal Australian Air Force’s (RAAF) F-35A aircraft were delivered by Lockheed Martin Australia today. 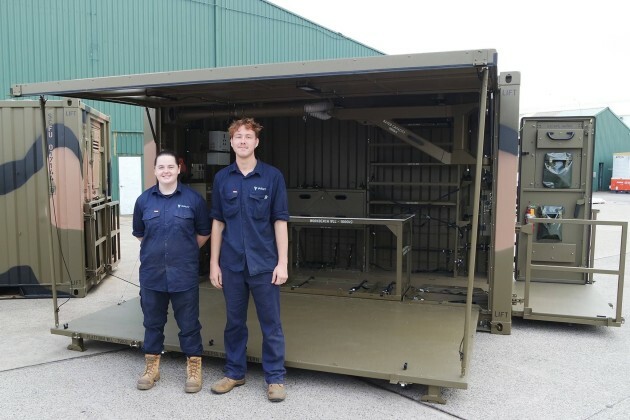 “These are the first of 29 deployable facilities that will provide transportable, secure workspaces for ADF personnel to support operations and maintenance activities,” Defence Industry Minister Chrsitopher Pyne said. “Without the deployable facilities, the aircraft’s full capabilities will not be realised...."
Do the Aussie E-7 Wedgetails currently possess MADL or MADL-capability (via SDR & waveform magic)? This post, viewtopic.php?p=371081#p371081, kind of wonders the same thing, but I don't see a definitive answer. If Wedgies don't have MADL now, do the gents down under have plans to add MADL to the E-7? If so, are they going to bake it in to the skin, use existing antennas & SDRs, or thrown BACN (NG Freedom550?) on it? We aren't really buying a LM shed, are we? Whoever wrote the intellectual property rights and got a shed in the list, deserves a bonus. "These secure and environmentally-controlled" Fair enough the veranda will give a bit of shade. Does this also mean they will put up plastic curtains when it's windy or rains? Last edited by optimist on 09 Mar 2018, 12:07, edited 1 time in total. Truly AWEsome - the Aussie SHED! Shoulda bin made of corrugated iron of the rusty kind. I guess the wheels are square. optimist wrote: We aren't really buying a LM shed, are we? "enviromentally controlled" is code for being equipped with a can of Aeroguard. Element, generally if I had an issue with bugs and insect in y accomodation while deployed In faraway exotic places I would call Room Service and have them deal with it. If we did have to slum it in a location such as Butterworth or Townsville then we had a secret RAAF recipe for bug spray made from a combination of Detol and baby oil that worked a treat. Last edited by operaaperta on 09 Mar 2018, 23:00, edited 5 times in total. Hopefully the "These secure and environmentally-controlled" means it has a beer fridge with a lock. Over in the dim dark recesses of some ongoing blah blah blah 'operaaperta' posted a 2012 PDF about Oz Super Hornet. The Super Hornet project (Project AIR 5349) was approved as a 10‐year Bridging Air Combat Capability with an intention to sell the aircraft back to the US on completion of this period. Withdrawal of the F/A‐18F Super Hornet fleet will be coordinated with the acquisition of additional JSF aircraft to ensure that no gap in our overall air combat capability occurs. 5.13 The budgets for the Super Hornet acquisition projects, and their costs to date, are shown in Table 5.1.
hornetfinn wrote: I thought it was very peculiar that a retired Danish Lt. Colonel decided to write Australian Foreign Affairs, Defence and Trade Committee about F-35 and his experiences with F-35 simulated flights. What was his motive to write to Australian committee and why did he leave some very important pieces of information out of his writing like years when he took part of those simulated flights (that was at least 12 years ago), what was the development state of simulators then (12 years ago it must've been very simple), what aircraft and missiles were simulated and what missiles he wanted to use. I'm sure he knows those details and meaning of those details. He must know that 12 years of development means huge difference and if he has followed F-35 program he must know that most of simulation capabilities has been added after he could've possibly took part of those simulations. So I did some intelligence gathering and it seems like Anker Steen Sørensen is endorsed in LinkedIn by no other than Carlo Kopp and Chris Mills (RepSim guy). Anker Steen Sørensen has endorsed at least Peter Goon of all people. All this can't be a coincidence, no way. I just wonder how on earth did APA/Repsim people get someone with Sørensens experience to join their ranks? I really wonder what's going on with them? Lost in translation, sorry. How do we know how old it was? An analyis of DCP Project AIR 6000's cost to date of acquiring "up to 100 Joint Strike Fightets" -- is the project running under budget? Phase 2A/2B – $4500m to $6000m for each of Phases 2A and 2B Phase 2C – $2500m to $3500m ... "
So the AIR 6000 budget in 2006 was up to $15.5 billion AUD (2006 year dollars). So the current program equivalent average cost in March 2018 dollars (AUD), for 72 x F-35, is still $2.51 billion AUD below the 2006 dollars (AUD) AIR 6000 budget. And given the large difference in year-dollars purchasing power (due inflation), this cost falls FAR BELOW the 2006 DCP allocated budgeted cost of AIR 6000. Plus we're buying the much cheaper F-35A, not the averaged cost of all three F-35 models, so the actual equivalent total capabilty cost will be even FAR LOWER again. The ADF's AIR 6000 program is late but running well under the allocated program budget, especially when 2006 dollar budget is converted to 2018 dollars, and the 'A' model's lower cost is factored in. Thus there are sufficient funds remaining to proceed with the purchase of a further 28 x F-35A, as per identified requirement for "up to 100" new "Joint Strike Fighters". The critics of the RAAF F-35A procurement have proven to be completely incorrect, so far, in all areas, except the time needed to aquire the capability, into IOC, in Australia. There is no reason on a basis of cost to not proceed with full proposed aquisition of up to 100 Joint Strike Fighters. one was for 100 units and one is for 72 units. The last time I looked, our budget is an all up price including runways, hangers and crowns, so it can officially be a hanger queen. I think these LM sheds may blow the budget, I haven't seen them mentioned before.